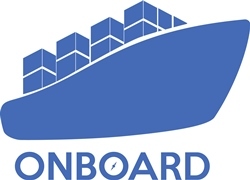 The Onboard Project is a two-year EU project looking at the development of technical profiles and training curriculum for the Ports and Logistics sector. Recognition of the project was announced during the coordinators meeting organised by the EACEA, on the 14th December 2018 in Brussels. From a total of 14 projects Onboard was identified as one of 3 which demonstrated good practice. Since commencing in October 2017, the consortium partners from Portugal, Ireland and the UK have designed two technical profiles and joint curricula for apprenticeships in the maritime sector, specifically for Ports and Logistics. This took place following interviews with members of the sector and their responses highlighted the skills gap caused by the increasing use of IT and Data Transfer. Although modernising and changing the way the sector performs, the majority view was that a need exists to ensure staff can manage the change by having the relevant digital skills linked to a good knowledge of Ports and Logistics operations. To meet this requirement the project has developed EQF Level 4 and 5 training. These two results are available to view online at the Onboard' s website. During next few months, the project partners will be preparing a set of activities involving sector stakeholders of the project, namely policy makers, apprenticeships providers, business representatives and clusters of the ports and logistics sector. One of the activities is validation at National and European levels of the technical profiles and curricula. Commencing at the beginning of February it will continue for 4 weeks and in the UK the validation will be carried out by telephone interviews conducted by the Marine South East. * Lisbon, Portugal - 12th of March, 10h30, at Port of Lisbon (TBC). If you are a stakeholder and would like to be involved with the validation process please email the relevant project partner (below). During its second year, the project will be developing a course for key professionals to aid them with the planning and delivery of apprenticeship training. There will be an opportunity to participate in this in Portugal, Ireland or the United Kingdom later in 2019 if you wish to register your interest. To accomplish these goals and strengthen the network of the Onboard project, partners are also inviting organisations, consortiums and professionals of the sector and apprenticeships' system to contribute to the project as an Associated Partner. Onboard is a two-year project co-funded under Erasmus+ programme. Portugal - Andreia Monteiro (INOVA +) andreia.monteiro@inova.business.